Got a few of those seemingly ubiquitous glass containers on your hands? Don’t can them: Put them to use. Fill jars about three-quarters full with cheesecake mixture. Bake uncovered in a large baking dish, with enough hot water to reach three-quarters of the way up the jars, until set, 25 to 35 minutes. Let cool and top with preserves, if desired. Refrigerate for at least two hours and up to three days. Kids can easily see inside the glass jars to find what they’re looking for, from crayons to glue sticks. Go lid-less for extra-long items, like pipe cleaners or colored pencils. A Mason jar makes a magical homemade night light: Fill a large one with a strand or two of battery-powered lights to add whimsy to a walkway or a nightstand. Top with a pin cushion of your own making: Separate the sealer and the screw cap. Place the sealer bottom side up on fabric and, using a pencil, draw a circle around it, about an inch wider all around. Use a glue gun to pipe a bit of glue along the rim, then fold the fabric around the rim, creating little bunches as you do. When you’re three-quarters of the way around the lid, stuff cotton batting between the fabric and the lid, making sure it’s even; finish folding the fabric and seal. Apply hot glue to the inside of the screw cap, place the sealer, and press. Allow it to dry. Binder clips in one jar, pencils in another. Practical and inexpensive. Make a party centerpiece out of drinks: Serve them up in jars garnished with make-your-own flags; use adhesive letters to spell out the phrase of your choice. Guests can help themselves as they take their seats. When the sun begins to set but your barbecue’s still hopping, scatter jars filled with white votive candles around the yard for a more casual take on hurricane lamps. Busted your blender’s jar? Until you replace it, try this temporary fix: Many detachable blade assemblies screw right onto a small-mouth Mason jar (or a mayo jar, as shown). Don’t fill it by more than half, though, and as with any regular blender, avoid very hot liquids. For a quick and healthy breakfast, layer yogurt, fruit, granola, pumpkin seeds, and maple syrup in a Mason jar or jelly jar. To preserve fresh basil, trim the ends and stow on the counter in a Mason jar filled with water. Better to drop your loose change at the end of each day into a DIY piggy bank than into your couch cushions. Are you a holiday cookie–swapper? 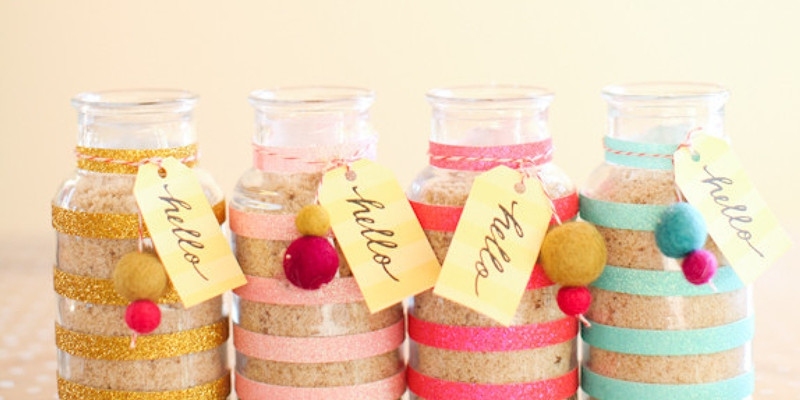 Packaging your treats in a simple glass jar will let them shine. Stack cookies or bars with alternating layers of colorful waxed paper for festive flair.